LEARN MORE and Have Fun! You are about to travel to St Petersburg, you have your hotel and taxi already booked, but for one reason or another you are still searching on the web for a city tour to join before you come. Well, if this is the case, look no further! Here you can find a list of different tours that can give you a great introduction to the city and its attractions. Photo of Peterhof; Tsarskoyse Selo; and the Church on the Spilled Blood. There are many ways to explore St. Petersburg Russia: you can hire a van or a car with driver, walk around, or take a boat along the river and canals of the city. From our own experience, the most popular tours are the Grand Tour of St Petersburg (You rent a vehicle with driver and tour the city with photo stops at the top attractions); a visit to the State Hermitage Museum (a guided tour inside the most famous museum in the world); a day trip to Peterhof or Tsarskoye Selo (a guided tour in and around the stunning residence of the Tsars). As the city has so much to offer there are plenty of options to choose from, the list is endless. Our Best St Petersburg Tours (the name speak for itself☺) will give you a complete St Petersburg experience within the time available to you. Our tours covers all the city's best attractions and famous landmarks, and help you learn more about the past and present of our beautiful city, and they also offer you a glimpse into the everyday lives of Russians. So if you're a first-time traveler or you're just looking for fresh ideas, then see the crème-de-la-creme of St Petersburg Tours below, and feel free to contact us, if you have any questions. Personal Note: All our tours listed on this page are private and can be personalized to satisfy anyone wishes and interests. However, you should know that in order to organize your tour, and give you an exact quote we need to know your travel dates, plus other information. Start your visit to St Petersburg with a fun and easy tour. Jump on board a modern and comfortable private van or car and take in the sights of the imperial city in just a few hours. Enjoy an informative and entertaining general introduction to Russia's Northern Capital and see all of the city's main attractions with an expert local guide. Itinerary: During this comprehensive city tour you will cover all of the main highlights of St Petersburg, hear about the history of the city and, of course, have photo stops in the most picturesque places. Sights covered on the tour: Winter Palace; Nevsky Prospekt; Kazan Cathedral; Stroganov Palace; Admiralty; Palace Square; Peter and Paul Fortress; Naval Museum; St. Petersburg University; Menshikov Palace; Academy of Fine Arts; Senate Square; the Bronze Horseman; Isaac's Square; Mariinsky Palace; St. Isaac's Cathedral; Palace Embankment; Field of Mars; Summer Garden; Alexandrinsky Theatre; Rastrelli Square; Smolny Cathedral; Anichkov Palace; Chuch of Saviour on the Spilled Blood as well as numerous canals and rivers and prominent monuments. Options: You can combine this tour with an inside visit to the following spots: the Peter and Paul Fortress's and Cathedral, the Hermitage Museum, St Isaac’s Cathedral, the Church on the Spilled Blood, Kuznechniy Food Market, Hay Food Market, etc. 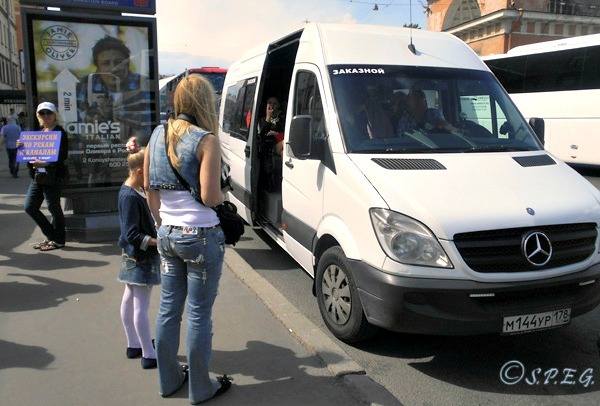 Ideal for: Families with kids, solo travelers, friends, couples, small or large groups of people wanting to get a general view of the city from the comfort of a vehicle in a short time. Seats Available: Car (1-4 People); Minivan (1-6 People); Minibus (1-20 People). Available Languages: English, Italian, French, Spanish, Portuguese, German, Greek, Chinese, Bulgarian, Russian. Exclusions: Entrance Tickets, Food and Drinks, Headphones, Tips. Warning: If you are a cruise passenger and you want to tour the city visa free you must hold a tour voucher. If necessary, we provide tour vouchers upon request for all our tours. INTERESTED? Send a Tour Request Today! Travel 25 kilometers away from St Petersburg and you get to Peterhof, the greatest of all the city's suburban Imperial estates. Just outside the city you can enjoy a pleasant stroll around the remarkable array of decorative fountains, sculptures and statues. Visit the Empress Elizabeth's Grand Palace, walk through several adorned imperial rooms and have fun running through the pouring water. Itinerary: During this tour you will be guided through the Great Palace, the Upper Gardens and Lower Gardens of the royal residence. 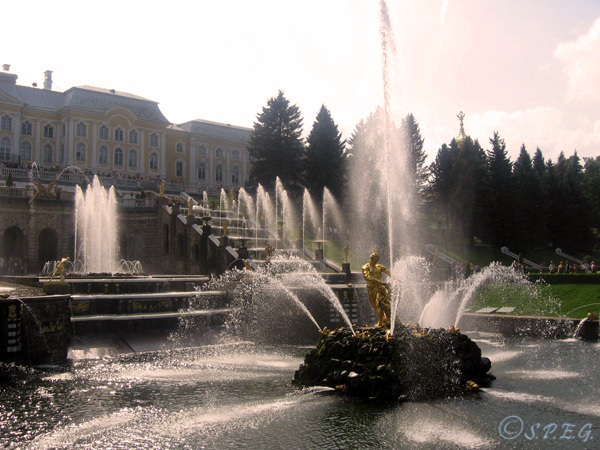 You'll see the world’s most elaborate fountain system in action with the highest water spray rising up to 23 meters, as well as many decorative single fountains, several gilded statues and marble sculptures. Sights covered on the tour: The Great Palace with beautiful rooms, halls and upper chambers; the large park with its dozens of fountains and thousands of works of art, including paintings, sculptures and applied arts, like the Great Cascade. Options: You can combine this tour with a visit to the Catherine's Block (a small but exquisite palace constructed for Empress Elisabeth); the Bath House (a little pavilion near Monplaisir Palace); the Hermitage (a little entertaining pavilion designed for the guests of the Royal family to have fun); the Marly Palace (another little private palace that dates back to the time of Peter the Great); and Oranienbaum (a small patch of land on the coast of the Gulf of Finland. Ideal for: Families with kids, solo travelers, friends, couples, small or large groups of people interested in the richest and most popular summer Royal Palaces in Russia where the Romanov family lived. Seats Available: Car (1-4 People); Minivan (1-6 People); Minibus (1-20 People); Hydrofoil (Ask for more info). Exclusions: Food and Drinks, Headphones, Tips to the guide or driver. Plan a day trip to the most fascinating Summer residence of the Tsars in Tsarskoye Selo, a little suburb of St. Petersburg. Walk through the picturesque park filled with quirky monuments, numerous pavilions, small bridges and exotic plants. Enter the outstanding baroque style of the Palace of Catherine and admire its sparkling Amber Room, and decorative gilded interiors. Itinerary: During this tour you will be guided through a magnificent gallery of gala rooms where many official dinners took place and admire a very interesting exhibition of furniture and pieces of applied art, which belonged to the Royal family. You'll also take a pleasant stroll through the beautiful Catherine Park and the surrounding area of Pushkin. 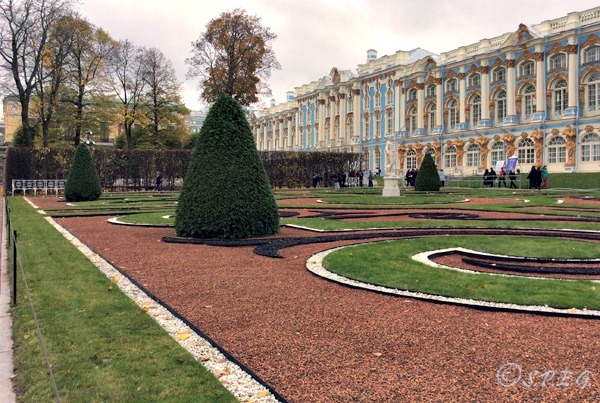 Sights covered on the tour: the Catherine Palace with its various dining rooms and halls; the Amber Room; the Palace Church; Catherine Park with its various gardens, buildings, statues, lakes, etc. 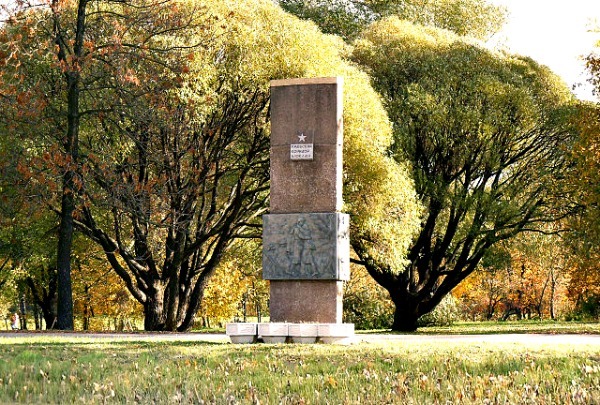 Options: You can combine this tour with a visit to Pavlovsk Palace (a former residence of Emperor Paul I); Alexander's Palace (a palace which was used by the last Russian Tsar Nickolas II and his family as their private home); the Monument to the Defenders of Leningrad (a monument which is devoted to the siege of Leningrad during the WWII). Ideal for: Families with kids, solo travelers, friends, couples, small or large groups of people interested in the richest and most popular royal palaces in Russia, where the Russian Tsars lived. Seats Available: Car (1-4 People); Minivan (1-6 People); Minibus (1-20 People); Big Bus (up to 45 People). 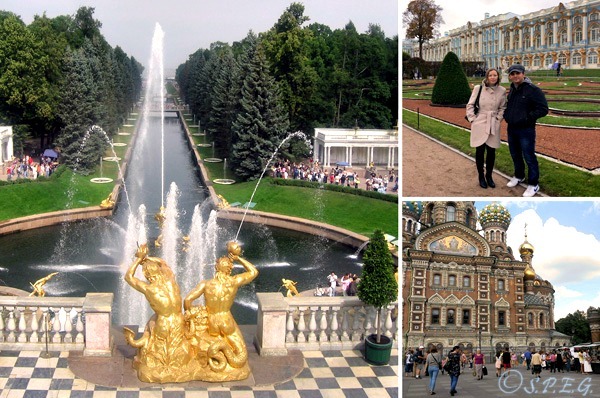 Get a feel of the wealth of the Russian Tsars with this intensive full-day shore excursion. 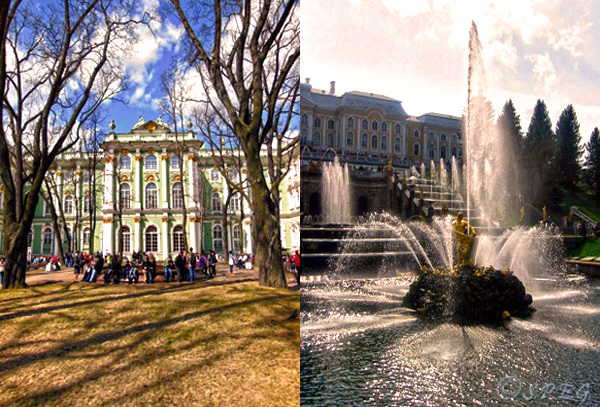 Explore the Hermitage, the largest museum in the world, and visit Peterhof, one of the richest and most interesting Summer Royal Palaces in Russia. If you're coming by ship to St Petersburg, and you have only very limited time and want to avoid large groups, then this private tour will be your best choice. Itinerary: After being picked up at the port terminal, we drive to and around the city with a stop at the Winter Palace for a visit at the Hermitage museum. At the end of your visit to the Hermitage you'll have lunch at a local cafe or restaurant, and then we'll take you to Peterhof. There you'll be guided through the Great Palace and the beautiful Lower Park. At the end of the tour we'll bring you back to the ship. Sights covered on the tour: Nevsky Prospekt and some of the key sights situated in the city; the Winter Palace; Palace Square; the Hermitage Museum; the Great Palace with is upper chambers, art galleries and various hall rooms; Peterhof Park with its dozens of fountains, thousands of works of art, including paintings, sculptures and applied arts. Options: You can customize this tour as you like. 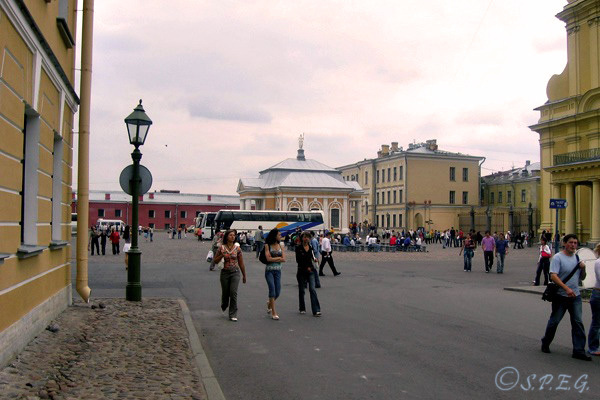 For example, rather than go to Peterhof, you can go to Tsarskoye Selo or visit another suburb of St Petersburg. Ideal for: Families with kids, solo travelers, friends, couples, small or large groups of people traveling on a cruise ship or ferry. 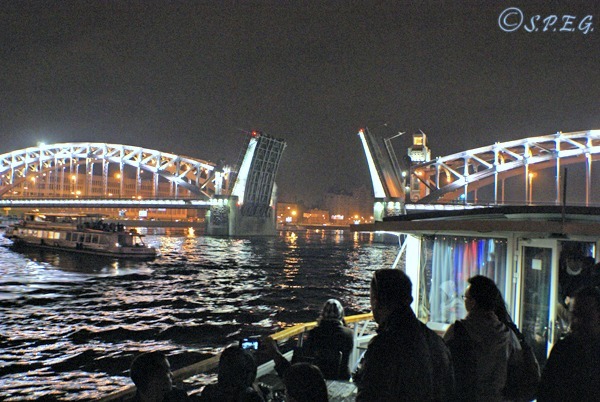 There is nothing more romantic and pleasant than taking a midnight boat tour along the Neva River and then watching the famous draw bridges rise up. Take this tour, especially during the White Nights, and enjoy the city's rivers and canals illuminated. Watch out for top city sights like Mikhailovsky Castle, the Peter and Paul Fortress, Vasilyevsky Island and learn all about St Petersburg from the on board guide. Itinerary: During this night tour you'll cruise on the Neva River under several drawbridges and admire the city's most prominent sights illuminated. You'll stop for a few minutes to watch the spectacular show of the drawbridges rising late at night, a very popular summer event among locals. Sights covered on the tour: The key sights of the city. Options: If you want, we can arrange a pick up transfer from/to your hotel or any other location in the city. Ideal for: Couples, friends, solo travelers, families with kids and small groups of people interested in seeing the city at night and from the boat. Exclusions: Food and Drinks, Headphones, Tips, Private Transportation by a Modern Car, Minivan or Minibus. 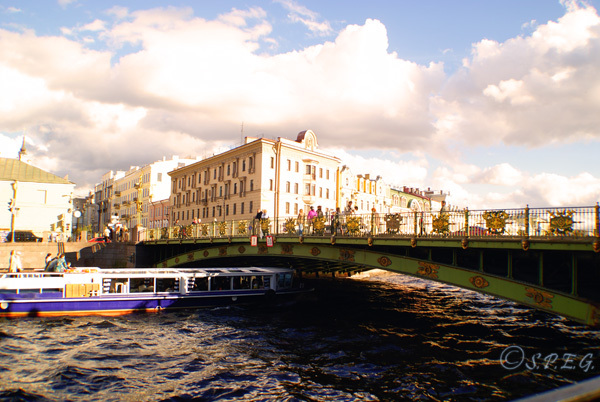 Enjoy a daily boat tour along the famous St Petersburg rivers and canals and get a better feel of the nature and character of old St Petersburg. Cruise down to the large Neva River, Fontanka River, Moyka River or Griboedov Canal and admire the countless bridges and 18th and 19th century buildings that line the vestured granite banks. Get a different view of the city and enjoy your cruise! Itinerary: During this river boat tour you enjoy a cruise along the Neva River, and get through the historical city center of St. Petersburg. You'll pass by several of the city's old rivers and canals and admire historical palaces and cathedrals, as well as small and large bridges, and mansions decorating the embankments. Sights covered on the tour: The Church on Spilled Blood; Mariinsky Theater; Peter and Paul Fortress; Winter Palace; Palace Bridge; Stroganoff Palace; Yusopov Palace; the Spit of Vasilievsky Island and more (You'll see them from the boat). Options: You can combine this tour with a bus city tour or a walking tour or even rent a private boat with a local guide who speaks one of the following languages: English, Italian, French, Spanish, Portuguese, German, Greek, Chinese, Bulgarian, Russian. Ideal for: Couples, friends, solo travelers, families with kids and small groups of people interested to get a general overview of the city from the boat. Note: If you want, we can arrange a pick up transfer from/to your hotel or any other location in the city. Discover the majesty of St Petersburg and its secrets, famous characters, art and history by going on a cultural walking tour with an expert local guide. Have photo stops in the most picturesque places, see famous landmarks close up, and experience the city in an intimate way. Book this private tour and get an insider's view of the Northern Capital of Russia. Itinerary: During this tour you'll take a long walk in and around the centre of St Petersburg where you can see imperial palaces, important cathedrals, monuments and graceful canals and rivers. You'll learn about the history of St Petersburg and hear interesting stories from an expert local guide and, of course, have photo stops in the most picturesque places. Upon request it is also possible to stop along the way for some shopping or for a bite to eat at a local cafeteria (own expense). Sights covered on the tour: Nevsky Prospekt; the Winter Palace Square; Peter and Paul Fortress; the Trinity Bridge; the Field of Mars; Spilled Blood Cathedral; St. Isaac's Cathedral; Admiralty; The Bronze Horsemen and others. Options: You can combine this tour with a visit inside one of these sights or other museums and cathedrals. Ideal for: Couples, friends, solo travelers, families with kids and small groups of people who love exploring on foot. Meeting Point: To be agreed. When: All year around, but better from early May to early October. Group Size: Up to 4 People; Up to 6 People; Up to 20 People. Exclusions: Food and Drinks, Headphones, Tips to the guide. Find out where Peter the Great first constructed the city of St Petersburg and hear thrilling stories about the Romanov family with a visit to the Peter and Paul Fortress. Then, go to the Museum of Political History of Russia and dive into the Red Revolution and other crucial moments in the history of Russia. 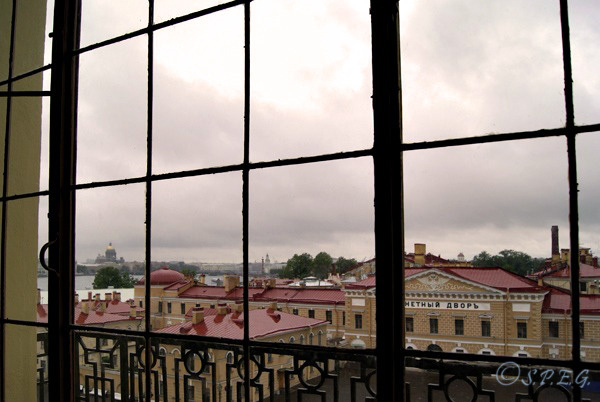 Learn about Stalin, Khrushchev and Brezhnev; see the tombs of the Tsars and enjoy great views. Itinerary: During this tour you'll be guided through the famous Cathedral of the Saint Apostles Peter and Paul and take a stroll around the territory of the Peter and Paul Fortress. You'll see numerous museums and enjoy spectacular river views from the fortress. You'll also hear stories about historical events and the Romanov family. After your visit to the Peter and Paul fortress, you can move to the State Museum of Political History of Russia where you'll get a chance to learn everything about the Soviet Past of Russia. Sights covered on the tour: The St Peter Gate; the Former Prison for Political Convicts; the Fortress with its artillery; the Cathedral of St Peter and St Paul; the Grand Tsars Mausoleum; the Boat House; the Mint; the Monument to Peter the Great; the Neva Gates; the interesting Museum of Political History. Options: You can combine this tour with a visit to the Log Cabin of Peter the Great, the first house in St Petersburg. Ideal for: Couples, friends, families with kids, solo travelers, and small groups of people interested in seeing St Petersburg's first settlement and learning about the evolution of the political system in Russia. During your Russian holiday don't miss a visit to St. Isaac's Cathedral, one of the largest, richest and most famous cathedrals in Russia, and step into the Yusupov Palace, one of the most elegant residences in Europe in the 19th century. Admire the decorative interiors, hear cool stories and enjoy breathtaking views. Complete this tour with a visit to the small Vodka Museum, and get a taste of Russian food and vodka. 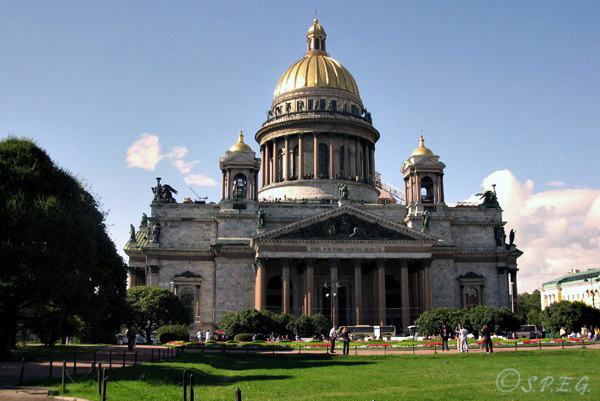 Itinerary: During this tour we'll take you to St Isaac's Cathedral, where you can learn about the details of its construction and historical events. Then you'll be guided through the famous Yusupov Palace where you can see the spot where Grigoriy Rasputin was killed and how the richest and most famous noble family, the Yusopovs, lived in Russia in the 19th century. After visiting the Yusupov Palace you'll end up at the Vodka Museum where you'll see an interesting short exhibition about the history of Russian vodka. Sights covered on the tour: the St. Isaac's Cathedral; St Isaac Square; the Yusupov Palace; the Russian Vodka Museum. Options: If you're ready to climb up 226 steps you can combine this tour with a visit to the Colonnade of the Cathedral (223 metres height) and take amazing photos of the city from the top. Also, after your visit to the museum of the vodka you can stop at the Restaurant next to the museum to get a taste of traditional Russian cuisine. Ideal for: Couples, friends, solo travelers, families with kids and small groups of people interested to combine a visit to the most famous cathedral in Russia with a shot of vodka and a taste of local food. Groups Size: Up to 4 People; Up to 6 People; Up to 20 People. Exclusions: Food and Drink, Headphones, Tips to the guide. Visit the most picturesque and impressive church in the city and learn about Russian art and culture all at once. 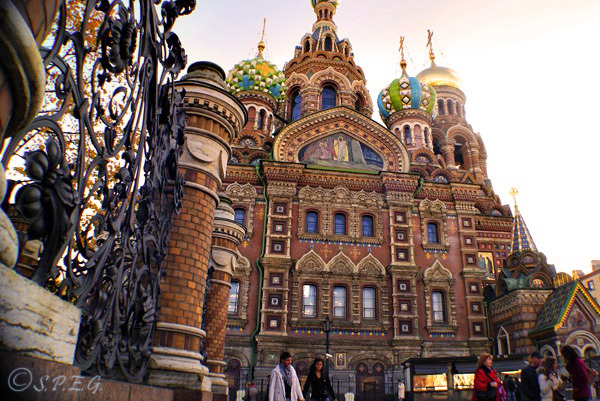 Take this tour and step into the Church of the Spilled Blood and the Russian Museum. Find out where Tsar Alexander II was murdered, admire decorative interiors made of 7500 square meters of mosaics and enjoy a unique collection of Russian art. Itinerary: During this tour you'll be guided through the famous Church of the Spilled Blood and learn about the history of the construction of the Church and the dramatic events that the Church has been through since its construction. Afterward, you'll take a nice stroll through the Michael Garden and then move to the Russian Museum where you'll enjoy an incredible Art Gallery displaying a collection of Russian art that includes paintings, sculpture, applied art as well as folk arts and crafts. Sights covered on the tour: the Church of the Saviour on the Spilt Blood; the Russian Museum; Michael Garden. Options: You can combine this tour with a visit to the Summer Garden. Ideal for: Couples, friends, solo travelers, families with kids and small groups of people interested to visit one of the symbols of the city, and learn more about the art and culture of Russia. Go beyond the standard tours and visit the battlefields of the Second World War and the memorial sites. Step back in time to the period between 1941 and 1944 with an expert local guide and learn everything about the Siege of Leningrad. Re-live the images of that terrible and heroic period of war by exploring the Diorama and Road of Life Museum or by visiting the moving Memorial Siege Cemetery and Museum. Itinerary: During this tour we'll take you along the Road of Life and visit the Museum of Road of Life which displays wartime relics. On the way back to St Petersburg you'll stop for a visit at the Diorama Museum near the Neva River, then at the Nevsky Bridgehead (one of the bloodiest battlefields in the world) and at the Leningrad Defense Museum. At the end of the tour we'll take you back to your hotel. Sights covered on the tour: the Road of Life; the Road of Life Museum; Nevsky Bridgehead; Leningrad Defense Museum and Siege State Memorial Museum. Options: You can combine this tour with a visit to the coast of Ladoga Lake in Morozova and see the island fortress of Oreshek, or go to Psikarevskoye Memorial Cemetery. Ideal for: Couples, friends, solo travelers, families with kids and small groups of people interested in learning about the most destructive siege in the history of human warfare. We recommend that you book any of our best St Petersburg Tours before the summer season starts because summer is considered high season, so finding a local guide available at the last minute is not doable. When booking ahead, you are guaranteed to find the best local guide, get the best price, and avoid long queues at the entrance of museums or palaces as we'll buy the tickets in advance. If you are coming by ferry or cruise I recommend that you read this page. Usually 8hrs are recommended to cover all the sites without rushing.